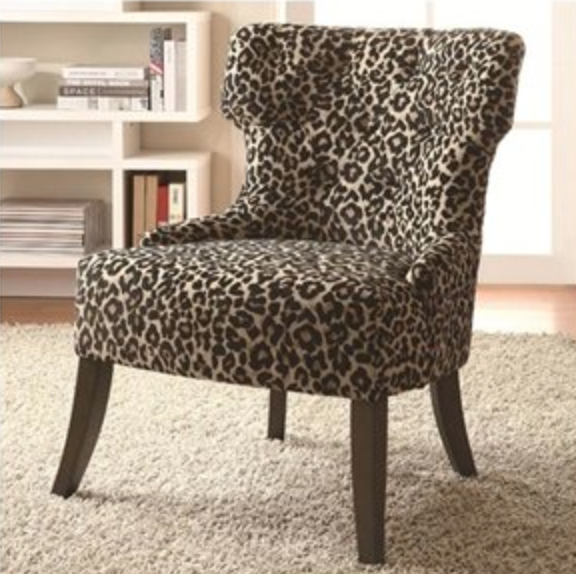 Transport yourself each day and night with the exciting Leopard animal print upholstery of this decorative accent chair. Designed for support as well as comfort, this chair features a lightly padded seat cushion and a soft tufted back. Exposed wood legs provide long, lean accents while a slightly curved back creates a comfortable place to sit down and relax. A sleek, armless construction creates a simplified look, adding to the transitional style that this piece emotes. Coaster realizes the importance of your home, which is why they have an endless variety of furniture in countless styles and designs.Decorating rooms with an exotic look, this living room furniture piece complements transitional, traditional and contemporary designs. Easy assembly is required. Accessories are not included. Dimensions: 28″L x 30.5″W x 36″H (Seat Depth: 19″) Weight: 28.9 lbs.